Although there might be a slight fear of artificial intelligence taking over the world, let’s remember the film industry’s intention is to sensationalize. Movies like “I, Robot”, “RoboCop” and “War Games” demonstrate the extreme possibilities that will never (hopefully) become our reality. The truth is that AI has generated positive experiences that are not at all headed in the direction of those thrill-seeking films. Today’s prospects appreciate how much better their online shopping experiences have become. It’s no small wonder, as AI has saved hours of hunting through racks and shelves in the hopes of finding that special item. And it’s only going to get better. At this point, AI shopping is considered to be reactive. That is because it is used to gather pertinent information about each prospect or customer. Searching, shopping, and purchasing information is culminated in the form of insights and recommendations. Smart searches now provide information on where to find similar or add-on items. Shopping in online stores also results in learning users’ tastes, purchasing habits and propensity to shop versus buy. AI saves consumers time having to sift through rows of racks of similar items. For example, most brick-and-mortar clothing stores subdivide garments by type: tops, shorts, shirts, etc. Online stores provide several ways to sort the items so locating something only takes minutes. The sort options include color, size, price, material, and popularity. While customers are browsing, AI is nearby so it can suggest supplemental or similar items and increase the price of the sale. Can you remember a time when an in-store sales person tried to cross-sell additional items? It took a great deal of time. Online cross-selling has turned into one of the most efficient ways of showing customers other possibilities. 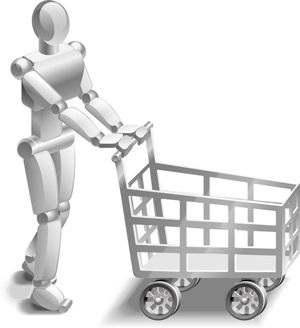 Plus, there is no pressure to “buy now” as extra items can be placed into a shopping cart until a decision is made. If a change of heart occurs with online purchases, the cost of returning the item is zero and it is a no-hassle situation. That is great news for customers. This represents a bigger problem for online retail outlets, as the estimated return rate for online purchases is anywhere from 15 to 30 percent as compared to a lower 8.89 percent in brick-and-mortar stores. But as a customer, the effort required to purchase and return an item is far greater. In-store experiences often include traffic, lines, and an inability to compare prices. When it comes to services, like insurance, investments, or healthcare, AI saves time in all directions. In fact, it is the single-most efficient way to sell and buy services all from the comfort of a home or office. Few people want to spend much time on face-to-face meetings when they purchase their insurance, conduct banking transactions or make simple investments. There is no need to spend hours on research when answers are readily available within minutes. Convenience has always been a key factor in popularity, which is why 7-11, McDonald’s and other chains multiplied so rapidly. What could provide more convenience than shopping online at work or home with the help of a store’s AI system that comprehends preferences?